이번 주는 beta adrenergic blockade and decompensated cirrhosis에 대한 내용입니다 (Reiberger T and Mandorfer M. J Hepatology 2017). NSBB (Non-selective beta-blockers) 사용에 대해 잘 정리된 Review로 관심있으신 분들은 읽어보시길 권해드립니다. Non-selective beta-blockers (NSBBs) remain the cornerstone of medical treatment of portal hypertension. The evidence for their efficacy to prevent variceal bleeding is derived from prospective trials, which largely excluded patients with refractory ascites and renal failure. In parallel to the increasing knowledge on portal hypertension-induced changes in systemic hemodynamics, cardiac function, and renal perfusion, emerging studies have raised concerns about harmful effects of NSBBs. Clinicians are facing an ongoing controversy on the use of NSBBs in patients with advanced cirrhosis. 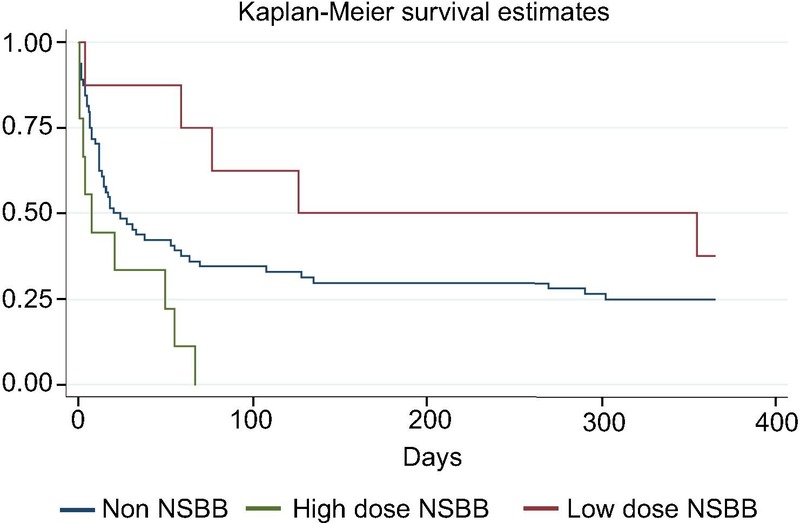 On the one hand, NSBBs are effective in preventing variceal bleeding and might also have beneficial non-hemodynamic effects, however, they also potentially induce hypotension and limit the cardiac reserve. An individualized NSBB regimen tailored to the specific pathophysiological stage of cirrhosis might optimize patient management at this point. This article aims to give practical recommendations on the use of NSBBs in patients with decompensated cirrhosis. Review에서 key points로 정리해 놓은 부분들입니다. 1. Non-selective betablockers (NSBBs) represent the cornerstone of pharmacological treatment of portal hypertension. 2. NSBBs also exert nonhemodynamic beneficial effects in patients with cirrhosis and seem to increase survival patients with ACLF. 3. Ascites per se is not a contraindication for NSBB treatment. 5. Patients with sepsis, SBP and HRS who are in need for vasopressor treatment should have their NSBBs treatment interrupted. 6. Low doses of propranolol (680 mg per day) seem to be safe and effective in patients with severe or refractory ascites. 7. Patients should be evaluated for TIPS in case of NSBB intolerance in secondary prophylaxis especially if refractory ascites is present as well. 우리나라 간경변증 가이드라인에 보면 다음과 같은 문구가 있습니다. "비선택적 베타차단제의 용량은 안정 시 심박동수가 25% 감소하거나 분당 55회에 이를 때까지 혹은 부작용이 발생할 때까지 조절한다. 한국인의 문맥압 감소를 보이는 propranolol의 적정용량은 평균 160 mg/일 이었다." 이후 저는 propranolol을 가능한 고용량으로 사용해 보려고 하다가 부작용 발생으로 고생한 적이 있습니다. Propranolol의 적정용량을 결정하는 것은 매우 어려운 문제인 것 같습니다. 이번 Review에서도 아래 보고가 언급되었는데, propranolol을 고용량으로 사용하면 오히려 생존율을 감소시킬 수 있어 위험할 수 있다는 보고입니다. 이런 자료들을 보면 propranolol의 적정용량을 사용하는 것은 매우 중요한 문제로 보입니다. NSBBs 용량은 보통 심박수를 55-60 bpm으로 조절하리고 권하고 있습니다. 이번 Review에서 저자들은 다음과 같은 dose titration strategy를 권하였는데, 눈여겨 볼 만 합니다. With regard to propranolol, we would recommend a dose titration strategy as following: first week: propranolol 20 mg in the morning and in the evening; second week: 20 mg in the morning and 40 mg in the evening, third week: 40 mg b.i.d. (twice a day); fourth week (if well tolerated): 40 mg morning, 20-40 mg at lunchtime, 40 mg in the evening. In our experience, a significant proportion of patients do not achieve hemodynamic response to propranolol doses <80 mg/d while 80-120 mg/d are generally well tolerated in most patients and yield higher hemodynamic response rates. For patients with severe ascites we prefer propranolol to carvedilol. SMC에서는 propranolol을 10mg bid로 시작할 것을 전공의 선생님들에게 권하고 있으며 HR 및 부작용, 특히 저혈압 발생 유무를 살펴보고 최종 dose를 조절할 것을 권하고 있습니다. 그런데 이렇게 HR를 기준으로 한 약제 용량 조절이 정말 환자분들에게 적정 용량을 주는 것인지에 대해서는 항상 고민이 많습니다. 특히, 얼마 전 Hepatology에는 invasive한 방법이지만 HVPG, 즉 문맥압을 직접 재면서 치료하는 것이 전통적인 방법에 비해 생존율을 향상시킨다는 보고가 있어서 더 고민을 하게 하고 있습니다 (Villanueva et al., Hepatology 2017). SMC에서는 HVPG는 잘 사용하고 있지 않습니다. "간경변 환자에서 beta blocker는 투약 여부 뿐 아니라, 용량에 따라서도 생존율을 향상시킬 수도, 감소시킬 수도 있으므로, 적절하게, 적정용량으로 사용하고 있는지 항상 고민하며 사용하자" 입니다.